Blood moon, gun violence: Lunar event provokes otherwise unexplainable string of deaths, injuries. 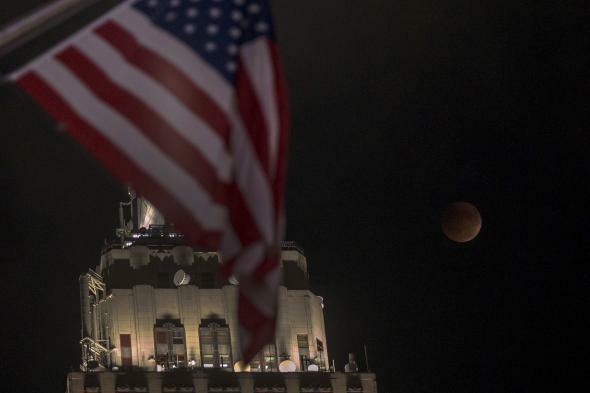 The “blood moon” as seen near the Empire State Building in New York on Sept. 27, 2015. At least 54 incidents of gun violence and 19 gun-related deaths were reported in the United States on Sunday before and during a “blood moon” eclipse, as the otherwise civilized, affluent country was struck by an outbreak of suffering that can only be explained as the result of cosmic forces. Such staggering levels of extreme gun violence are almost never seen in the U.S.’s advanced peer countries such as Japan, Canada, and the United Kingdom. But for some reason—probably the way the moon looked—American citizens died brutally during the course of the day at rates more often seen in countries like Niger and Latvia. On Saturday, a day on which there was no blood moon, 93 incidents of gun violence were reported in which 28 U.S. resisdents were killed, but there is probably some other supernatural explanation for that strange outbreak as well.